Membership is open to graduates and diploma holders in Food Science, Technology and Engineering and to those engaged in the profession. As per the option exercised, each member will receive print copy of Indian Food Industry (IFI MAG) & online JFST. AFST(I) Diamond Jublee Life Membership Drive: Opportunity Back Again. Members will receive Print copy of Indian Food Industry Mag (IFI Mag), and online access to Journal of Food Science and Technology (JFST). Voting rights to elect Chief Executive Committee (CEC) of AFST(I) online and compete for the various offices of AFST(I) except Student and Affiliate members. Discounted rates for AFST(I) events like IFCoN and ICFoST. Be a part of the largest and strongest Association of Food Scientists and Technologists in India. And many other professional benefits like backing of a Network of Food Professionals worldwide. For Members (from India) who apply directly for Life membership pay Rs. 11446/- (Incl. of 2 yrs full membership fee) and endorsement of 2 AFST(I) members OR Self attested degree certificate required. "Indian Food Industry Mag will be supplied to the members from the month of acceptance of their Membership". Application form should be completely filled. Endorsement by the Two AFST(I) Members or attested copy of degree Certificate is compulsory. 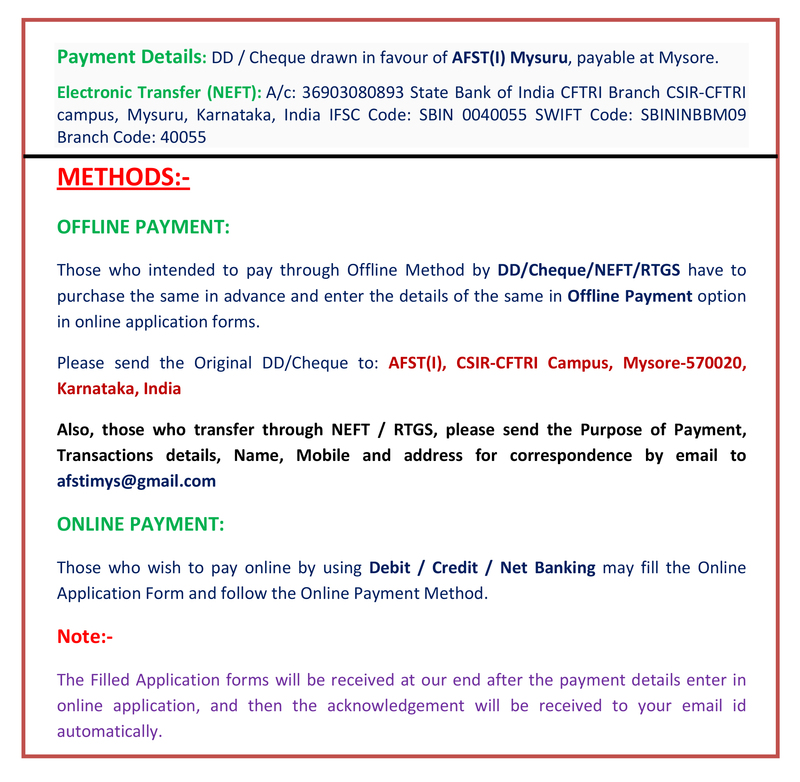 DD/Cheque should be drawn in favour of AFST(I) payable at Mysore. Please include Admission Fee with every new membership. In need of more Application Forms make Photo Copies/Xerox. Ph.D. Scholar Students/Research Fellows are not considered as Student Members, but eligible as Full Members. Students and Affiliate Members are not eligible for Life Membership. Are you a PhD Scholar ?